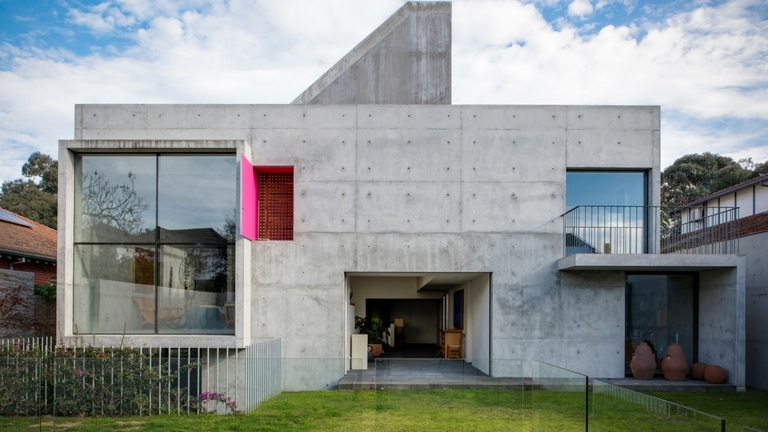 This striking concrete house in Camberwell evokes a strong Mexican sensibility. Broad stones set in a shallow moat beckon visitors to the large pivotal front door heavily set in the off-formed concrete façade. Designed by renowned Mexican architect Andres Casillas de Alba, a protégé of architect Louis Barragan and one of the last surviving members of the Bauhaus School, this extraordinary home would not have been realised had it not been for the owners, Andrew and his Mexican-born wife Victoria. Architect Matthew Scully, co-director of Evolva Architects, was instrumental in making the master’s work a reality in one of Camberwell’s wide, leafy streets. For Andrew and Victoria, who live in this house with their two children, the first taste of experiencing a house designed by Casillas (now 82) was while staying at one of his homes (owned by the couple’s friends) in Acapulco. “The more I look at Casillas’s work, the more difficult it is to describe his homes. You could say they were ‘Gestalt’ (a holistic approach). 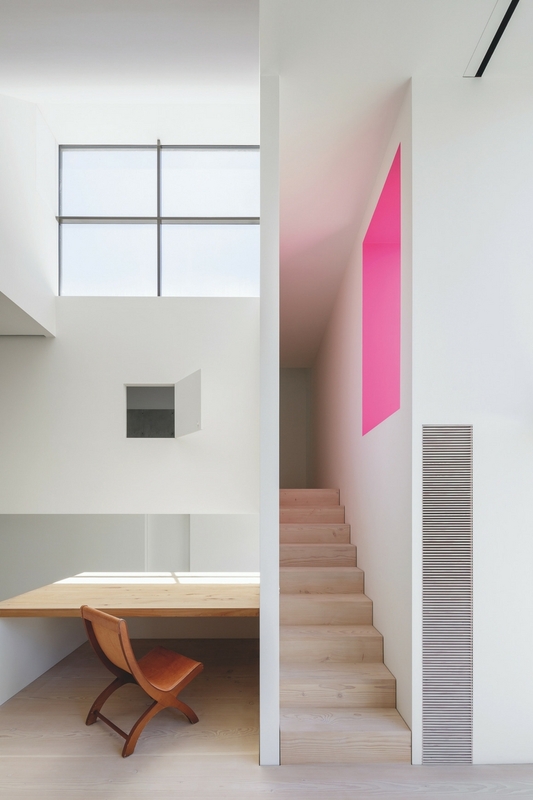 But there’s always that contrast in ceiling heights and the way passages widen to reveal a space beyond,” said Andrew, who also admires the way the light changes in the home throughout the day. Unlike many contemporary homes that ‘scream for attention’ from the street, this house turns away from the outside world. However, in contrast to the slightly ‘fortified’ façade, the open plan living areas inside are more akin to a courtyard, with a laneway creating a link to the back garden. “Victoria and I made several trips to Mexico to meet with Casillas. His plans were quite conceptual and novel to the way most Australians live. He would often say ‘architecture is simply the skin around your interior space’,” said Andrew, who has become a close friend of the architect. The Mexican vernacular of a central courtyard (protected under a roof) and surrounded by functional spaces, has been carefully interpreted by Evolva Architects. Large sliding doors at the end of the passage or ‘laneway’ allow entertaining with family and friends on a grand scale. “We pull out the trestle table and seat up to 20 guests, even when the weather turns,” said Andrew, who, like his family and friends, enjoys the way northern light filters into the home from a large highlight celestial window. The elevated platform, which comprises the open plan lounge and dining areas, together with the kitchen, forms the hob of the home. In the living area, the ceiling reaches a maximum height of almost nine metres, while in the kitchen it’s just over two metres. “You get this wonderful play of volumes,” said Scully, who like Andrew appreciates the monumentality/weight of having ceilings skimming across one’s head, like in the second living area, located on the mezzanine and directly above the kitchen. “Having these few low ceilings evokes the heavy ancient temples you often see in Mexico,” said Andrew. 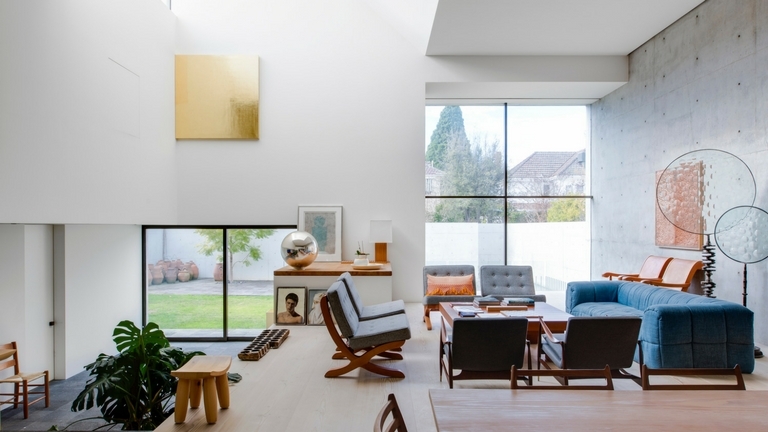 Materials used in the Camberwell house are extremely refined and considered. The off-formed double-height concrete wall in the main living area (absorbing the winter sunlight) is finely juxtaposed to the pristine white plaster walls and Douglas fir floors sourced from Denmark. This restrained palette becomes the perfect backdrop for the couple’s paintings, sculptures and artefacts, many of which come from Mexico. Casillas also designed the built-in joinery, made from Sabino (with a sweet scent). The parchment table lamps on the various built-in desks are also a hallmark of Louis Barragan’s interiors. Some of the paintings, displayed on easels, are Andrew’s, painted with the same finesse as the way each plane and surface within the home fuses together. Highlights of fuchsia or ‘Mexican Pink’, as it’s referred to, create highlights in window shutters and in strategically placed alcoves that ventilate the home. Scully was aware of the importance of working on this house, mindful that he was interpreting Casillas’s vision Down Under. “Casillas is at the forefront of modernism, but his lines are tempered with an appreciation for folk art,” said Scully. “When I first saw the plans, they appeared quite childlike in their simplicity,” he adds.